Introducing two new optical shutter systems from SRS — the SR470 Laser Shutter Controller and SR474 Four-Channel Laser Shutter Driver. These shutter systems are designed specifically to minimize vibration on your optical table. They are built around a unique shutter head, supported by one of two available controller models. 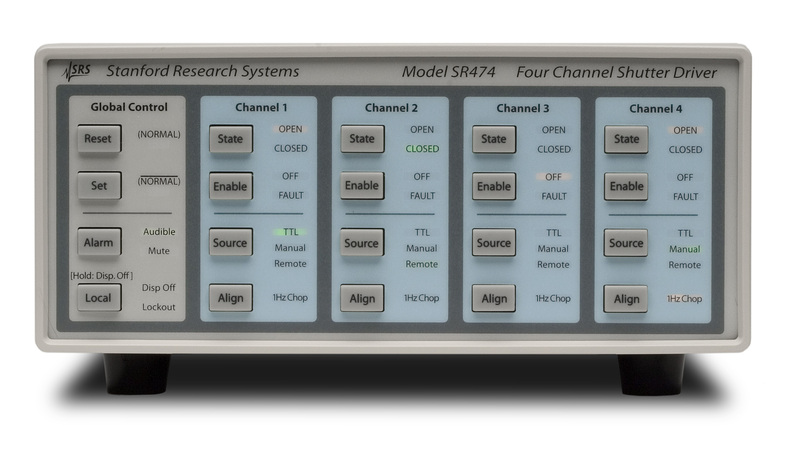 The SR470 provides timing signals to a single shutter head, while the multi-channel SR474 drives up to four shutter heads, and is controlled by external timing signals. Unlike conventional solenoid based shutters, the SR475 shutter head contains a closed-loop DSP control system that precisely guides the shutter blade between open and closed positions, never encountering physical stops. Vibration and mechanical noise are kept to a minimum, leaving your optical table disturbance-free. The shutter blade is mounted between sapphire jewel bearings that minimize friction and result in a head lifetime in excess of 10 M cycles — orders of magnitude more than is typically found in shutter heads. The 3 mm clear aperture is designed for easy alignment and is large enough to be used with common light sources. 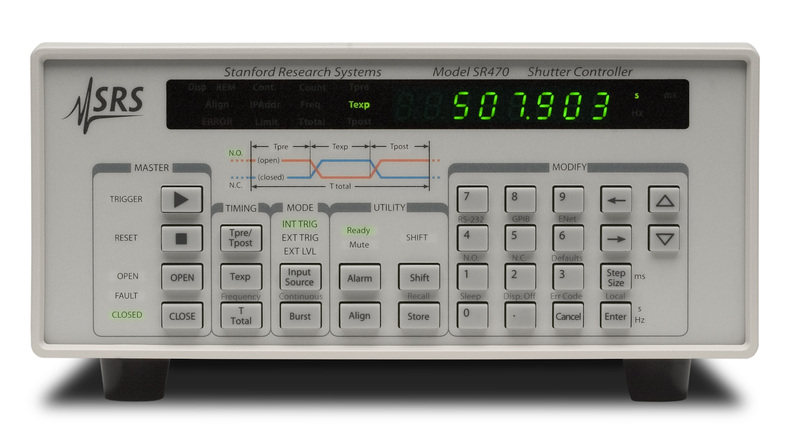 Typical rise and fall times are under 500 µs, and repetition rates from DC to 100 Hz can be used. Unlike other shutters, the SRS shutter is not duty cycle limited — you can run any duty cycle you choose. 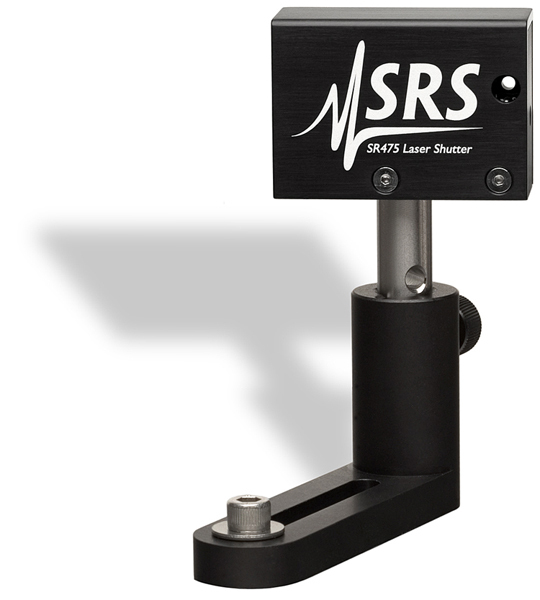 The SR470 Shutter Controller allows you to generate timing signals for the shutter head. You have complete control of the exposure time, which can be set between 4 ms and 10,000 s with 0.1 ms resolution. Pre- and post-exposure delays can also be configured. A bright green 8-digit LED display shows the current parameter in seconds or hertz, and timing is accurate to 100 ppm. A variety of trigger modes are provided — internal, external, front panel, and continuous — giving you the flexibility to handle just about any application. Triggered bursts from milliseconds to months can also be generated, placing the SR470 in a class of its own. In addition to triggered sequences, the SR470 can also act as a driver to actuate the shutter head from your own timing signals. You can also manually control the shutter from the front panel. Remote operation is supported with GPIB, RS-232 and Ethernet computer interfaces. All instrument functions can be controlled and read over any of the interfaces. Up to nine complete instrument configurations can be saved in non-volatile RAM and recalled at any time. Shutter faults are automatically detected and reported with audible and electronic (TTL) alarms. 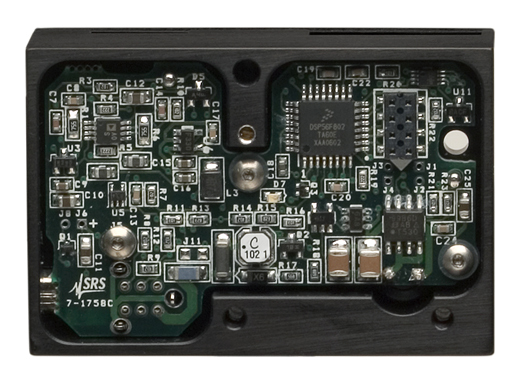 The SR474 Four-Channel Driver interfaces with up to four shutter heads. Rear-panel TTL level inputs are provided for your external timing signals. Each of the four channels can be set for normally open or normally closed operation. Each channel has a front-panel State button which allows you to manually change the shutter state. 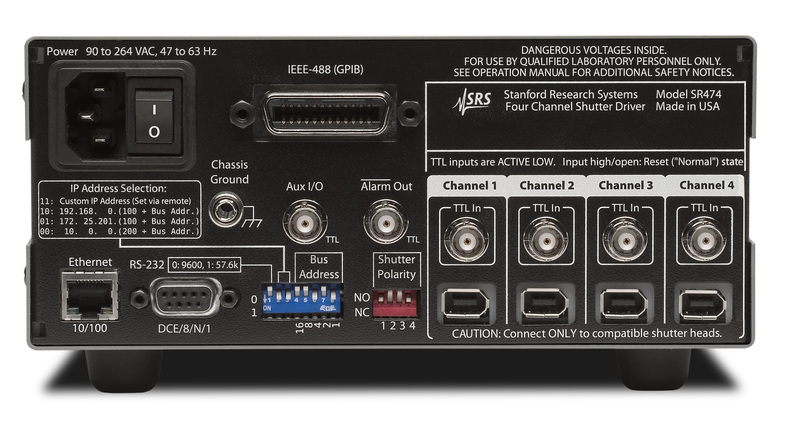 The channel Source buttons set each channel to manual, external TTL or remote state control. Each channel also has an Align button that drives its shutter head at a 1 Hz rate making laser alignment simple. The Global Control section of the front-panel allow you to set or reset all channels to their “normal” states. 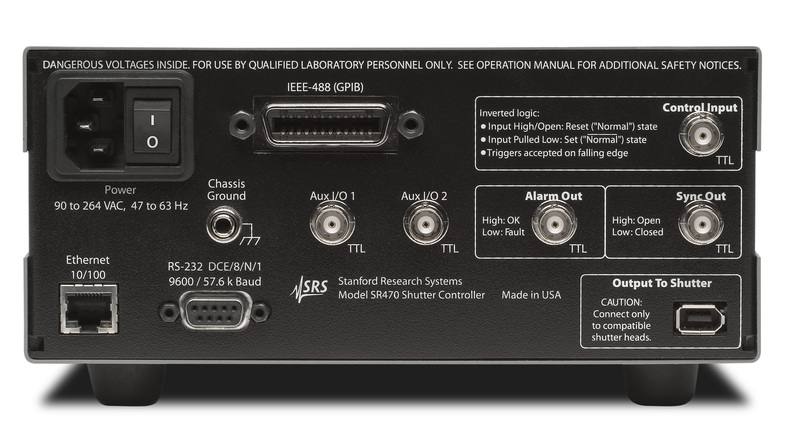 As with the SR470, remote operation is supported with GPIB, RS-232 and Ethernet computer interfaces. All instrument functions can be controlled and read over any of the interfaces. Shutter faults are automatically detected and result in audible, visible and electronic alarms. Unlike conventional designs, the SR475 Shutter Head can be mounted on your optical table in any orientation. This gives you complete flexibility to route the mating cable out of the way of your experiment. The 3 mm aperture is positioned very close to the chassis edge, making the SR475 ideal for chopping one of two parallel beams separated by less than a centimeter. It also allows you to operate your lasers very close to the plane of your optical table top. The small size of the shutter head make it ideal in tight quarters, and with a precision guided blade, shutter vibration is essentially eliminated. Blade position Closed-loop PID controlled. Can be operated as NO or NC. Alarm types Fault LED indicator, audible alarm, and rear-panel TTL output. System automatically detects shutter fault. Display blanking Front panel LEDs can be disabled. Interfaces GPIB, RS-232 and Ethernet. All instrument functions are controllable over the interfaces. Save/recall Nine sets of instrument settings can be saved and recalled. Auxiliary I/O ports Rear-panel Aux I/O 1 & Aux I/O 2. TTL level, multipurpose ports. Control input Context sensitive TTL input. Triggers on falling edge. TTL-high resets to Normal state. TTL-low sets to Normal- state. Sync out Rear-panel TTL level output. Shutter state Shutter state can be controlled manually from front panel or from external TTL timing signals. Channel enable Front panel Enable buttons enable or disable each channel. Global control Sets or resets all channels to their "Normal" states. Shutter alignment Front-panel Align buttons cause selected channels to change state at a 1 Hz rate for easy laser alignment. Modes Front-panel Source button selects external TTL, manual or remote (computer interface) state control. Alarm types Fault LED indicators, audible alarm,and rear-panel TTL output. System automatically detects shutter fault. Display blanking Front -panel LEDs can be disabled. Interfaces GPIB, RS-232, and Ethernet. All instrument functions are controllable over the interfaces. Shutter polarity "Normally Open" and "Normally Closed" states for each channel are set on rear-panel DIP switch.